Not only do the hosts of CNN’s programming reveal themselves to be overt advocates for the left, they show a complete lack of understanding of even the basics of American civics and history. CNN’s Don Lemon recently stated on air that not only is mob harassment acceptable (if, of course, the harassers are unhinged “progressives”), but is a Constitutional right. It’s so, so hard to watch CNN. I try to tell myself that I’m “taking one for the team” by watching some of their programming and relaying what’s being said to all of you. I feel that Americans should know what the left is spewing out and what many people across the country are consuming without even thinking. But, man is it difficult to watch. Wow! I’ve never seen so many wrong, uneducated statements is such a short amount of time… ever. You can watch the exchange for yourself. As you know, the Bill of Rights is a contract between the federal government and the people. It is not a contract between a football player and the team owner. It is not a contract between mob protestors and those who want to peacefully enjoy a meal in a restaurant. Lemon makes up definitions to suit his and his employer’s left wing agenda. Mob rule is mob rule, and if you say it’s ok for an angry mob to scream and harass and threaten people who are walking along a sidewalk or enjoying dinner, then you are condoning mob rule. Lemon’s comments were quickly addressed by those who actually have half a grasp of reality. I'm just curious if @donlemon would feel the same way about people protesting if they did it at an abortion clinic? My money is that he would say "That's different, because, Shut Up!" The “this is not a mob” memo circulated by the left did not just land on Lemon’s desk alone. CNN’s Brooke Baldwin echoed the talking point by rolling her eyes at the mention of a mob during her recent program. Mob rule is wrong. Yes, people can protest, but to say that anything goes as long as it’s a leftwing radical doing it is ridiculous. Civil discourse starts with people being civil. Those on the left, including so-called journalists, are showing that violence and threats of violence are ok if it moves their agenda forward. They can’t win at the ballot box. They can’t win by blocking Supreme Court nominees through smears. Their next strategy is mob rule, and the consequences will not be good. Ok, then punching-out Commie Numpties Network urinalists is ours! Thanks Scruffy, that is the bottom line, no matter how many lunatics try to redefine the Constitution. AND since the Scotus has ruled several times before, THERE CAN BE LIMITS ON WHEN AND HOW One protests, in regards to being required to get permits to do so, or NOT being on private property. 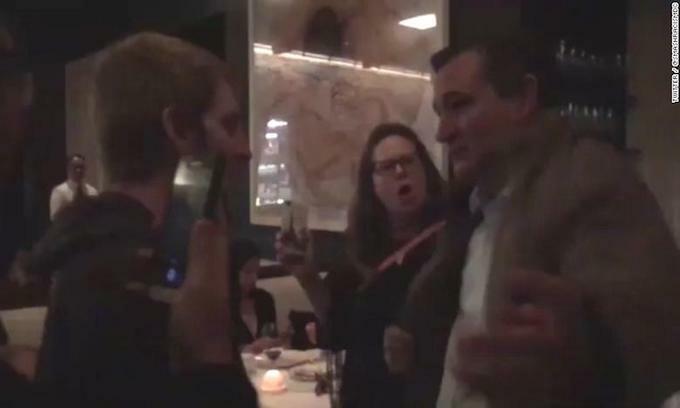 HOW CAN THESE morons, say “HARASSING” people in a restaurant, is protected? As often as the Libs claim their constitutional rights for everything (I have a RIGHT to access to health care…) they don’t know and definitely don’t love the Constitution. For the scant few who have actually taken the time to read the Constitution, none of them demonstrate even the most basic understanding of the Constitution. Liberals BASTARDIZE words to fulfill their agenda, GAY, MOB, ILLEGAL to undocumented etc…. Always Using Charlottesville as an example of a “mob scene” but fail to report who initialized the VIOLENCE. Always claiming everyone on the RIGHT as NAZIS, WHITE SUPREMISTS, or even FASCISTS, then think that they have a right to silence them. However, those demonstrators in Charlottesville had a legal permit and a CONSTITUTIONAL RIGHT to redress their government that was destroying confederate statues and symbols, the Soros backed thugs in black hoods did not and they had weapons intended to hurt and maim the outnumbered demonstrators. Then Democratic politicians state that “NAZIS” do not have a right to free speech, hate speech is illegal, and only the LEFT can define what is HATE. These people are FASCISTS and MARXISTS, they just want to bastardize Socialism to mask their TOTALITARIAN agenda. Maybe a good way to expose their hypocrisy would be for large numbers of pro-life activists to peacefully pay visits to various mainstream media corporate headquarters, ensuring that everything is recorded on video. Oh that’s right, we would be called haters, agitators, and arrested cause ‘google’s private property. How is it that most of the large internet providers, like Google, are left wing organizations? Where can we go to find a conservative site that will not block the conservative voice? Google has removed FoxNews from my favorites…no where to be found. I have to type it in each time…not a major effort but Google is trying to silence the voice of reason. How can these people sleep at night? And when I try to open GOPUSA, it won’t open because they say it might be a phishing scam. Google is a phishing scam. I have to click Open anyway just to hear a balanced report. I used to listen to nothing but NPR, but found that this government supported outlet was totally liberal, so liberal they fired Juan Williams, who now sits at FoxNews. Wow! Does he really demonstrate by his comments how whacko the left is. This great country, which Obama tried to destroy, needs a lot of help. Then STOP Using Google for your search engine. Switch to DuckDuckGO! Worldmighty…they sleep great at night because they are dead inside. Soul-sucking vampires is what they are. As enraged as I get seeing Hillary CLinton and that other Obama fool Eric Holder come out with their stupid comments clearly meant to incite these freaks who have hijacked the Libtarded Democrat party and seeing those other Antifa/BLM scumbags up in Portland OR accost that older white gentleman in his vehicle and beating on his car with a collapsible ASP baton which is a weapon, let’s all take a couple steps back and take a couple of deep breaths. There’s nothing I would love to see more than a garbage truck loaded come barreling down the street running all of them over followed by a street sweeper but let’s look at this objectively. The Democrats have ABSOLUTELY NOTHING left but the rhetoric of violence. President Donald Trump has succeeded in not only breaking the back of the Dem party but removing the facade they’ve hidden behind all these years. The paid shills on CNN and MSNBC are towing the line for their corporate masters. The vast majority of the American public is CENTER/RIGHT and wants and values peace, public safety and prosperity and Donald Trump has delivered it in spades!! I can’t imagine any other man having the gumption of our president to do what he has done and in such short span of time. Donald Trump has been what this nation needed for a long time. Thank God he made the decision to run!! The MSM may make it appear that the mobs out there protesting are in the hundreds of thousands but their not. Its a bunch of washed up old libtards mixed in with a bunch of clueless socialist college students(if you really even want to call them that) that want to feel like their agents of change for their generation. They can’t debate facts because they don’t even know what the facts are. I know everyone is pretty ramped up right now but it really is a time to bask in the glory of victory. I’m finally hearing from life long libtard friends and family members that this isn’t the Democratic party they remember or want any part of. Most of these folks have kids and they would like to see their kids have some sort of future in the same country they grew up in. This radical nonsense might play well to Bolsheviks and anarchists but not to mainstream Americans. The democratic party will never recover from this. By opening the door and letting in the likes of a dimwitted, make-believe socialist like Ocasio-Cortez, BLM, Antifa and whatever other lunatic fringe group, they have signed their own death warrants. Violence is the last tool left in their bag of tricks. Should they actually attempt a violent uprising they will be stomped like the cockroaches they are. The next thing you know, the talking heads on CNN will be saying it’s just fine to yell “Fire!” in a crowded theater. Or a crowded studio. As much as the Left plays a “long game” of enacting the elements of the Communist Manifesto at a rate of one item per decade, they sure are short-sighted when it comes to how the means they use to achieve their ends today (e.g., Harry Reid’s “nuclear option” of changing the Cloture Rule from 60 votes to 50) might be used against them later. Conservatives already know better than to give a favored leader power that they wouldn’t want a tyrant to wield. Leftists seem intent on learning it the hard way. Since they seem to see rioting, as ‘peaceful protests’, i can easily see these morons, saying “Yelling fire in a crowd should be allowed”. I say let the morons at CNN, MSNBC, Maxine Waters, Nancy Pelosi, Hillary CLinton, Obama, Moochelle, Eric Holder and that whole freak show that calls itself the Democratic Party keep on talking. In fact hand them the microphone and turn the volume up to 10 so all of the US can hear them loud and clear!! They have nothing left in their bag of tricks but the rhetoric of violence. No economic plan, no jobs plan, absolutely nothing left to sell to the American public. NOT EVEN SNAKE OIL!! The majority of the country is center/right and wants public safety and prosperity not ANARCHY. Every day for the past 2 years, even going back to when Trump was just a candidate, they MSM have tried to manufacture scandal after scandal and create an atmosphere of chaos and confusion around him in efforts to bring Trump down. They have failed and failed MISERABLY!! The only ones they’ve succeeded in taking down is themselves and the Democratic party. They think they are too smart for the public to catch onto their antics but the public has grown weary of it and sees it for what it is with the exception of deluded libtards suffering TERMINAL STAGE 5 TRUMP DERANGEMENT SYNDROME!! With the # of times i’ve seen people on the street harassed by press folk, cameras shoved in their faces, mikes in their chest, and flashes in their face, sometimes from barely a foot away. I CERTAINLY would love to see them get a taste of their own medicine. Say 5000 candle lumen flashes, and 200db squeals right to THEIR EARS! These num nuts wouldn’t understand a mob if it bit them. Typical CNN idiots and guest idiots. Let’s all go to CNN, storm the set and protest IN THEIR FACES. They said it was OK…. How do these moron’s get to live past puberty? They are way too stupid to think for themselves. I will say it again, when is the media going to be held accountable for there actions. Someone IS going to be hurt and / or killed. When that happens, Maxine, CNN and anyone on record for advocating these “protests” should be put on trial as accomplices. My idea is to start doing the same thing to Don Lemon et al when they are eating out in NY restaurants. We are not a ‘mob’–we are just gathering as per out First Amendment Rights. And if we happen to be carrying photos/posters of pitchforks and torches, we would just be illustrating the fact that WE. Are. Not. A. Mob. With visual aids. I’d certainly LOVE TO SEE someone do just that. Storm into one of their on-air live sets, and start protesting in THEIR FACES. BUT iirc their buildings all have armed guards PROTECTING THESE cretins. Don’t call a Mob a ‘Mob’. Don’t call a Pervert a ‘Pervert’. Don’t call a President who want’s to MAGA ‘Good’. Don’t call killing human beings in the womb ‘Murder’. Don’t call a person who makes up fictitious accusations for political purposes a ‘Liar’. Don’t call a woman who (illegally) uses a personal computer for restricted, top secret communications endangering the the entire nation, not to mention hundreds of operatives all over the world, a ‘Criminal’. The list is endless and getting longer every day. I suggest that a “gathering” of conservatives surround Mad Max, and by the way, make sure they are persons of color so she can’t decry racially motivated attack, and see how fast she runs for the nearest exit while holding onto her dime-store synthetic wig. I predict she will use the “M” word in describing the gathering. So I’ll just exercise my second amendment rights when threatened by a demonrat mob! I wonder how many can run @ over 800 FPS. Low velocity ammo, I see. In urban settings, short, fat, heavy “Flying Ashtrays” tend to stay in the initially intended target, instead of dumping a portion of their stopping power beyond the threat and potentially into an innocent bystander instead. Very true. For home defense 800fps is MORE than adequate stopping power. Lemon is your usual dumb knowing nothing about the Constitution. The 1st Amendment doesn’t grant the right to harass individuals. But I’ll concede that if Lemon will agree it’s okay for me to exercise my 2nd Amendment when I’m attacked by these anarchists. I guess they can’t read. Peaceably is not a mob. And last i checked, Restaurants are PRIVATE property, ergo one has no right to ‘protest’ inside a restaurant, WITHOUT EXPRESS permission of the owner. This is what I’ve been saying all along: Dems are fine with the Constitution and Bill of Rights for THEIR rights but no one else has ANY rights whatsoever! Heaven help our nation if they regain power … LOCK AND LOAD! Exactly. Texas college, the other day, had a BUNCH OF whiney cry babies, ranting about how “DARE Steven crowder come back to campus, and trigger them”.. Even to the point one of the bratty gals, called the campus security to try and kick him Out. EVEN THOUGH HE was politely sitting down on a table set up on a PUBLIC SIDE WALK.. using his 1st amendment rights to protest/hold a conversation. SO WE’ve seen they have no problem squelching OUR RIGHTS To protest or assemble etc, but demand we stop calling THEM OUT FOR mobbing folk, when they legally have no right to do so.. ONCE AGAIN proving, dems have no standards BUT DOUBLE STANDARDS. I do not think violence is the answer. If i am out eating dinner and someone comes up and starts to shout and harassing me i will calmly get up excuse myself and place my chair along side their head. NUFF SAID!! I shall use any word I choose to describe the violent MOBS that often grace our towns and cities, with their violent and crude behavior. They cover their faces, because they are cowards. I’m beginning to think the word MOB fits the news outlets, as they clearly harass the president day in and day out, year in and year out using the exact same words, which indicates they got their talking points, not from research, but from their Progressive Democrat leaders. They no longer have journalistic pride. Someone at CNN didn’t do his homework. The wording of 1A is: Congress shall make no law respecting an establishment of religion, or prohibiting the free exercise thereof; or abridging the freedom of speech, or of the press; or the right of the people peaceably to assemble, and to petition the Government for a redress of grievances. These yahoos are anything but peaceable. mikeyparks, I love your innocence! Homework….Research at CNN. There seems to be some confusion as to who did and who didn’t do homework. Someone at CNN didn’t do their homework. Nobody at CNN did their homework. I thought of eating in a restaurant as a private activity protected from demonstrations and panhandling inside. If Don Lemon is right, then his workplace is not private and demonstrators can approach him closely enough to prevent his face from being on camera. He could even be the protester instead of doing his job. If a not-mob of leftists obstructed his job, he would have to accept them or call them ultra right wing extremists, making them a yes-mob who of course do not have equal rights to violate the rights of others. This was supposed to be a “5” rating. It’s funny how the liberals never recognize the Constitution as legitimate until they can find a way to twist its meaning to support an illegal or criminal agenda. As i’ve often said. THEY ONLY want the constitutional rights to be protected for THEM. No one else. And now, armed with our renewed First Amendment rights to protest, back to the abortion clinics. So according to CNN, I can go stand in the door of an abortion clinic and verbally harass all of the workers and abortionists who work there as long as I don’t get physical. Yea right. The courts have ruled against that time and time again and have create exclusion zones around abortion clinics that protesters have to remain outside of. Those same zones should be extended to anyone to prevent them from being harassed in their homes and when they go out to eat. Anyone know where Lemon and the other CNN drones eat? Might be interesting if that info could be made available. Hell, what about where they live? it may be a constitutional right but so is carrying a weapon in Indiana, if confronted by a mob of protesters a person could reasonably think that their or their families lives and safety were in danger. CNN might want to educate Don Lemon on the law and how it applies to self-defense. At some point, the person or people being “mobbed” may experience what they feel is a genuine threat and will respond with lawful self-defense. Regardless of which of the mob members caused the escalation, they are all bound together in responsibility. You assume the imbecils running CNN know what the law is.. Kind of hard for them to educate someone about what’s right and wrong, when THEY DON’T know what it is themselves. Only some left wingnut libtard could dream this up. The sad part is he actually believes it. Whatever happened to Dr. Martin Luther King Jr.’s rhetoric regarding peace? I know that people think that it’s the new way of communicating; however, if we would have done mob type behavior towards Obama’s administration, we would have been arrested. These rabble rousers prove day in and day out, MLK sacrificed all for NOTHING.